In Student Venture, we're all about seeing changed lives. Seeing a teenager go from darkness to light, from hopelessness and lack of direction to meaning and purpose for their life. At our FastBreak conference recently, we saw God work in supernatural ways, convicting the hearts of students and showing them their need for Him. Below, Chip, one of our staff, shares about what God did in the lives of 5 guys from his inner city school. It's not your typical "guy thing" so keep reading below. At our Fastbreak this year, God did a great work in the lives of 5 young men from Eisenhower ninth grade school, a pretty rough school on the edge of the inner-city that has a lot of problems. This was the first SV conference for all of these guys, and some of them admitted that they came to the conference for the wrong reasons and with wrong intentions. The second night we were there God really spoke in a powerful way and worked in each of their lives deeply. Three of the guys accepted Christ that night and stood to proclaim their decision to the entire conference. The other two had already made decisions for Christ but weren't living for Him. As God worked in their hearts that night, they made a deeper commitment to the Lord and were changed as well. After the evening program they went back in their room for the cabin chat time. Their staff leader opened up their time in a word of prayer. Almost immediately, these five guys put their arms around each other and broke into a spontaneous prayer time that went on for almost an hour. They prayed very simple, childlike prayers of thanksgiving, confession and supplication, interspersed with words of encouragement, repentance and apologies to one another and expressions of love for one another. It was quite an amazing time. Then they sat down and began to talk about what had happened that night. They were so filled with joy and excitement about what God was doing in their lives, especially the three who had received Christ that night. Some of the guys in the cabin next door came over because they had heard a little about what was going on. As each new person came in, they were greeted with a hug and "I love you" from at least one of the guys in the room. Before long, many of the guys from both cabins were sharing their struggles, hurts and confessing their sins and were all loving on each other and trying to encourage each other in whatever they were facing. (Try to imagine a bunch of tough, inner city guys hugging each other, telling other guys that they love them, asking them for forgiveness.) Many tears were shed and many issues dealt with. The next day they were so excited to go out witnessing on the day of outreach. Two of the guys who had accepted Christ the night before had the opportunity to lead someone to Christ at the mall. Some of the other guys did as well. When they returned they wanted to share with the whole conference what had happened to them and how God had changed their lives. When they returned to school on Tuesday, there was a buzz in the school about these guys and the changes that had happened. Several of the guys went to some of their teachers and apologized to them for being disrespectful and acting up in their classes. They also went to other students and asked for their forgiveness for things that they had done to them in the past. This week they packed out the SV meeting with 60-70 students and the guys shared how God had changed their lives and some of them apologized to the entire group for anything they had done that had hurt or offended them. They encouraged the rest of the students to make sure they knew Christ and to live for Him and not for the world. The students, teachers and even the school principal were all greatly encouraged by what was shared at the meeting and by what God has done. Today is Cooper's 6 month birthday! 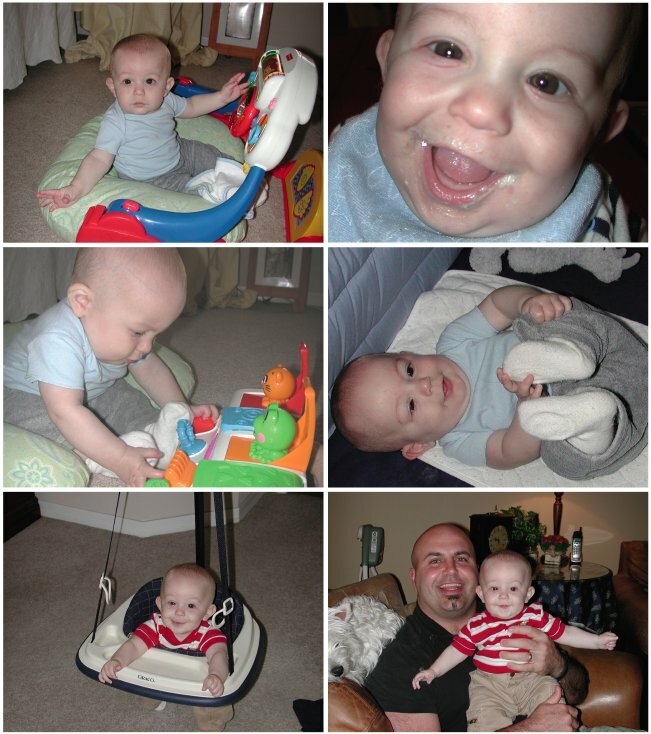 It seems like yesterday that he was able to fit in the palm of one of my hands, now he is sitting up and loving life. Laura is still breast feeding and we've recently added some solid foods (picture above w/ food on his face was his first solid food meal). So we want to encourage you to go out, buy yourself a peice of birthday cake, sing Cooper a "Happy Birthday" melody, and enjoy the rest of your day.